Mickey's Speedway USA is a Disney racing game for the Nintendo 64 and Game Boy Color, developed by Rareware and published by Nintendo under license from Disney Interactive. It is styled after other kart racers such as the Mario Kart series and Diddy Kong Racing. Mickey's Speedway USA includes a Grand Prix mode, as well as multiplayer racing and battle modes. Six characters are available initially, and four additional characters can be unlocked. The default characters are paired in likeness, and each pair is given the same statistics, such as Donald and Mickey having average statistics, or Pete and Goofy having a concentration in speed and quickness. Mickey's dog, Pluto, is captured by the army of Weasels for his "diamond" collar (later found out to be fake). As one of the drivers, including Disney characters such as Mickey, Minnie, Donald, Daisy, Goofy and Pete, the player races on tracks in the United States, based on locations such as New York, Alaska, Florida, Indianapolis, Grand Canyon, Chicago, Dakota, Texas, Colorado, Malibu, San Francisco, Yellowstone National Park, Los Angeles, Las Vegas, New Orleans, and Seattle, to find the Weasels and save Pluto. A screenshot of the Nintendo 64 version showing a race, with the player controlling Mickey Mouse. The Nintendo 64 version received "average" reviews according to video game review aggregator Metacritic. ^ "Mickey's Speedway USA for Nintendo 64 (2000) - MobyGames". MobyGames. Retrieved 25 August 2017. ^ "Mickey's Speedway USA for Game Boy Color (2001) - MobyGames". MobyGames. Retrieved 25 August 2017. ^ "VG Records". VG Records. ^ "Mickey's Speedway USA :: GBC Game Review". Kidzworld. Retrieved April 11, 2009. ^ Frankle, Gavin. "Mickey's Speedway USA (N64) - Review". AllGame. Archived from the original on November 14, 2014. Retrieved December 5, 2014. ^ "Mickey's Speedway USA (GBC)". Electronic Gaming Monthly. 2001. ^ EGM staff (February 2001). "Mickey's Speedway USA (N64)". Electronic Gaming Monthly. Archived from the original on February 11, 2001. Retrieved December 5, 2014. 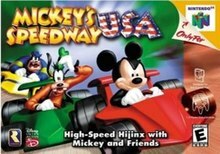 ^ "REVIEW for Mickey's Speedway USA (N64)". GameFan. November 10, 2000. ^ "Mickey's Speedway USA (GBC)". Game Informer (97). May 2001. ^ Reiner, Andrew (January 2001). "Mickey's Speedway USA (N64)". Game Informer (93): 136. ^ Uncle Dust (April 25, 2001). "Mickey's Speedway USA Review for Game Boy Color on GamePro.com". GamePro. Archived from the original on November 22, 2004. Retrieved December 5, 2014. ^ Four-Eyed Dragon (February 8, 2001). "Mickey's Speedway USA Review for N64 on GamePro.com". GamePro. Archived from the original on February 9, 2005. Retrieved December 5, 2014. ^ Liu, Johnny (November 2000). "Mickey's Speedway USA Review (N64)". Game Revolution. Archived from the original on August 7, 2001. Retrieved December 6, 2014. ^ Provo, Frank (March 28, 2001). "Mickey's Speedway USA Review (GBC)". GameSpot. Retrieved December 5, 2014. ^ Satterfield, Shane (November 15, 2000). "Mickey's Speedway USA Review (N64)". GameSpot. Retrieved December 5, 2014. ^ Harris, Craig (April 10, 2001). "Mickey's Speedway USA (GBC)". IGN. Retrieved December 5, 2014. ^ Mirabella III, Fran (November 10, 2000). "Mickey's Speedway USA (N64)". IGN. Retrieved December 5, 2014. ^ Cave, Lewis (October 4, 2011). "Mickey's Speedway USA (Nintendo 64) Review". Nintendo Life. Retrieved December 6, 2014. ^ "Mickey's Speedway USA (GBC)". Nintendo Power. 142: 125. March 2001. ^ "Mickey's Speedway USA (N64)". Nintendo Power. 138: 124. November 2000. ^ "Mickey's Speedway USA for Game Boy Color". GameRankings. Retrieved December 5, 2014. ^ "Mickey's Speedway USA for Nintendo 64". GameRankings. Retrieved December 5, 2014. ^ a b "Mickey's Speedway USA for Nintendo 64 Reviews". Metacritic. Retrieved December 5, 2014.